Katherine was born and raised in Portsmouth, and attended college in Missouri. After living in Bos ton and Toron to, she met her husband on a commune in West Virginia, and moved to the Bronx, and then back to NH with him. After years of raising two children and co-owning a business with her husband, she returned to school and earned an MFA from Vermont College in 1996. She was the grateful recipient of a NH State Council on the Arts Individual Artist Fellowship in 2000. 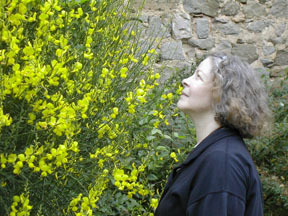 She has been a member of the Skimmilk Poets for ten years, and has published poems in Green Mountains Review, The Worcester Review, the Spoon River Poetry Review, Color Wheel, and other journals and anthologies, and has a chapbook, "Tempting Fate," in the Oyster River Press chapbook series, "Walking to Windward." She taught for several years at the NH Community Technical College in Claremont, Springfield College, and at Elderhostel. She is currently working on a Sixties memoir. When I received a postcard from friends visiting Tuscany, I propped it against my computer as a focus for daydreaming. The postcard showed a farmhouse, the kind that has often been turned in to a vacation rental under the agri tourism movement. A shed and a ladder were faintly visible at one side. I’d always wanted to go to Tuscany, and found I was inserting myself in to the postcard when I looked at it, standing outside below a second s tory window at first. Before long, in my imaginings, I was inside the second s tory room, looking out at the landscape from that window, my hair still long and blonde, held back with a hairclip. I never meant to write a poem, but I began to imagine one, a what-if poem: what if I really had been there, what if I dropped my hairclip, what if I climbed the ladder? The rest is.........well, more imagining. The poem developed as part of my daydreaming, and as I began to "hear" it, I gave myself an exercise: to extend the what-if’s until I found the s tory. to swirl the stucco when the suncooked wall was new.